That was the tag line of one of the most infamous films to come out of Hammer studios. Infamous not for its content but for the chaotic circumstances of its production. 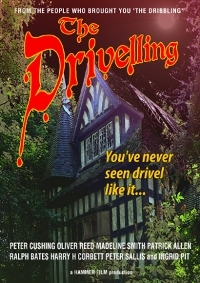 In 1972, at a time when the glory days of Hammer were long behind it, the studio found that it had a surprise hit on its hands in the shape of low-budget gothic horror thriller The Dribbling. Keen to cash in, Hammer quickly began production on The Drivelling, an all-star sequel, but it could not have foreseen the problems that would ensue. The film managed to chew up and spit out five different directors before principal photography had even begun. Graeme Carter had been hit by a falling piano just a week after he was hired, and although he survived the incident it was subsequently felt that the accident had left him too short to properly command the respect of the crew. Second choice, Albert Parks, father of acclaimed independent director Quentin Parks, left the project to direct an award-winning series of frozen pea commercials. The studio then turned to Colin Smith, a director of international repute who had been mentored by Federico Fellini. Sadly they got the wrong Colin Smith and had to let him go when they found out that he was a delivery driver for a bakery in Chelmsford. Happily, they finally managed to get hold of the right Colin Smith, but tensions quickly arose and the temperamental director ultimately stormed off the production claiming that he could no longer work with his own shadow. The movie's fifth director, Geoff Geoffreys, lasted an impressive three days before he was struck by the same piano that had taken out Graeme Carter. When the studio finally chose Max Tranter to see the project through, they issued him with a crash helmet - a decision which was both tax-deductible and instrumental in ensuring his continued involvement. The plot of the film is fundamentally a rerun of the first. Lonely traveller Ralph Bates chances upon an isolated manor house and inadvertently stumbles upon the machinations of the evil Dr Congo Barsham, played by Peter Cushing. All pretty standard stuff, although the movie is notable for including a lengthy shopping trip, a visit to a launderette and an extensive scene in which our hero calls upon his sister who talks at some length about her varicose veins. For many years it was thought that this was a brave attempt to ground the film with commonplace scenes of everyday life, although an alternative explanation has recently come to light. It seems that screenwriter Marvyn P Murcheson had inadvertently submitted the wrong typescript, sending in a 'to do' list instead of the finished draft. Director Tranter had already been shooting for a week before this was discovered and decided that it would be expedient to include these scenes in the final movie rather than starting over from scratch. As if script difficulties and falling pianos were not enough of a headache, Tranter also had problems with his cast. Peter Cushing spends most of his time on screen with his back to the camera. Being such a likeable and amiable person, nobody had the heart to tell him that he was facing the wrong way. Oliver Reed was less problematic, but only because he wasn't there. Although he appears on the bill, Reed does not actually appear in the film as he was stuck in traffic for the entirety of the shoot. Even so, this did not prevent him from being nominated for a BAFTA. And famously, Harry H Corbett had a very public falling out with Vincent Dimucci over a parking space, thereafter refusing to shoot any scenes with him. This was particularly difficult since Vincent Dimucci was a large purple hippopotamus which existed purely in Corbett's imagination and Corbett was forever calling a halt to filming claiming that the objectionable animal was in shot. The film was roundly panned on its release but, as is the fate of most tawdry, pedestrian and unimaginative dross, it has since gained the status of cult classic. Next month sees its first release on DVD and Blu-ray, so expect to see it in supermarket bargain bins very soon.